When flying around it is important that pilots knows where they are at all times. This stops them from getting lost. However, it is also good for the personal on the ground to be able to keep an eye on the flights. The most basic form of flight checking is to check the airlines web site. This is will tell a person when a flight has arrived or if it is delayed etc. For example Flightaware. It is possible for some of New Zealand to ask Air Traffic Control (ATC) where one particular aircraft is. However, there are a few limitations. The first is that often ATC are very busy and are not able to help when you want them to. The other is that the radar around NZ does not cover all areas which often means that the only information that ATC has is a pilot report. These are possibly very old or incorrect if the student reports wrong. It is also possible to pay a nominal fee and gain access to a website that shows what ATC can see. This is however, limited by aircraft having a functioning Transponder (a device used to connect with ATC’s tracking systems). The equipment that ATC use include both primary radar and secondary radar. Primary radar is less common these days but uses the Doppler Principle to determine aircraft distance from the radar and speed. However, this version had a few limitation such as weather interference and other object could be pick up such as birds. Secondary radar uses the aircraft transponder to gather extra information to positively identify different aircraft. There is another system in place called SARWATCH. This is a system which looks after aircraft and will ring the alarm bell if the aircraft doesn’t report in on time. This has a limitation too, it relies on the pilot to be active and accurate will position reports and activate the service before they leave. However, when an aircraft does go missing, at least SARWATCH may have a better starting point than starting from departure. 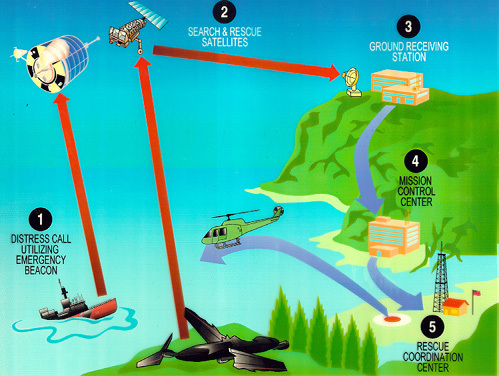 One of the compulsory pieces of equipment for every aircraft is a functioning ELT (Emergency Locator Transmitter) that in the event of an accident helps Search and Rescue locate the aircraft. This equipment however, either needs to be turned on automatically with strong G-forces (and not be destroyed) or manually turned on. Either way generally its only useful after an accident. SARWATCH is useful for training flights and recreational flights. More importantly the flight that are looking at long distance flying, where the aircraft could be flying over forest or barren terrain or even water. In places like New Zealand there is a vast range of different terrain which could make it impossible to find an aircraft or very difficult to get to, if the aircraft was to make an emergency landing. This is of course worst case scenario, there are other benefits to being able to monitor flights. Examples of these are checking the student has flown the correct path, monitoring arrival and departure times, being able to account where aircraft are during a less serious incident such as a breach of airspace. In training all these scenarios and more could make each flight more beneficial because the instructor can debrief the student even if they were flying solo (this is where the student is flying without an instructor on board, sometimes with another student). These devices use the GPS system often linked with a website to send information about the aircraft’s location and be presented in a form that the user of the ground can see historic and current information about the aircraft easily. These device now come in a variety of forms, some are hardwired into the aircraft (this can make them very expensive) other come in portable forms (like SpiderTrack) which are able to be plugged in and used in multi aircraft1. These devices have a number of benefits which can be seen as advantages. As per above, it can make flights more beneficial, and also help during an emergency. The knock-offs also mean that the level of safety is improved because each aircraft can be potentially monitored for longer even outside radar coverage (ATC). It also helps increase Situational Awareness of the ground crew. In New Zealand, this technology offers an extra increase due to the terrain and the limitations of radar coverage. It means that even light aircraft can be tracked when flying through remote locations where the coverage is limited there is still the ability to location aircraft. Also if pilots or even passengers understand the processes in which aircraft are located and time for rescue, they can plan appropriately in order to best survive the situation. If for example the pilots know that a Mayday call was received, that their location is known and the weather is good, it is unnecessary to ration food for make shelter. However, if the situation isn't as pleasant, by understand how the tracking equipment works, the pilots can move themselves to a location that the equipment is more likely to be useful. The main disadvantage is the initial and ongoing cost to keep running these devices. But also the sense of ‘Big Brother’ where the pilots may feel they are always being watched. They may also become so mollycoddled that the pilots never really experience real situation because they become reliant on others to look out for them. Even with these systems proper technique of navigation and situational awareness should be taught to the pilots. As technology grows unique features can be added to these devices, automation being the key. For example the device Spidertrack is able to send pre-programmed message on arrival or departure or alert ground users when the aircraft is off track. There are a number of possibilities that are able to be used to improve the safety of every flight.